Communication . . . always makes demands. It always demands that the recipient become somebody, do something, believe something. It always appeals to motivation. Peter Drucker, Management: Tasks, Responsibilities, Practices, p. 487. Bill is a relentless communicator. As a marketing manager for a large packaged goods company, Bill understands the power of communicating with the consumer. He carries over this philosophy to his people. As one who operates in the realm where the application of knowledge about consumers and customers is power, Bill believes in liberating information so that his people can use it to do their jobs better. Bill also is an early adopter of technology. He was among the first to embrace email as a means of sharing information as well as giving direction. Wireless communications is a boon to Bill; he prides himself on always being accessible and in touch. In addition, Bill set up a departmental intranet where employees could post updates on their work and also share documents. The team even works collaboratively online through the services of a departmental network. As a result, the department has a strong esprit de corps. This connectedness has spurred cooperation because colleagues know more about one another's projects and can share information more easily. This sharing has produced true organizational growth because the lessons learned on one project can often be carried to the next. The e-communication revolution has certainly produced harmony in the ranks, but lately some employees are beginning to feel overwhelmed. While they appreciate Bill's keeping them abreast of developments, his emails, once a trickle, are now a veritable tsunami. And the emails don't stop when Bill is out of the office. Evenings, weekends, and out-of-town trips do not stem the flow. In fact, it seems that the more Bill is away, the more he sends messages. Accompanying his messages are the inevitable to-dos. His people cannot keep up. As a result, the happy workplace that Bill fostered so diligently is beginning to fray at the edges. People have become edgy, snapping at one another and going out of their way to avoid Bill. One or two refuse to check their email more than once per day for fear of getting another wave of things to do. 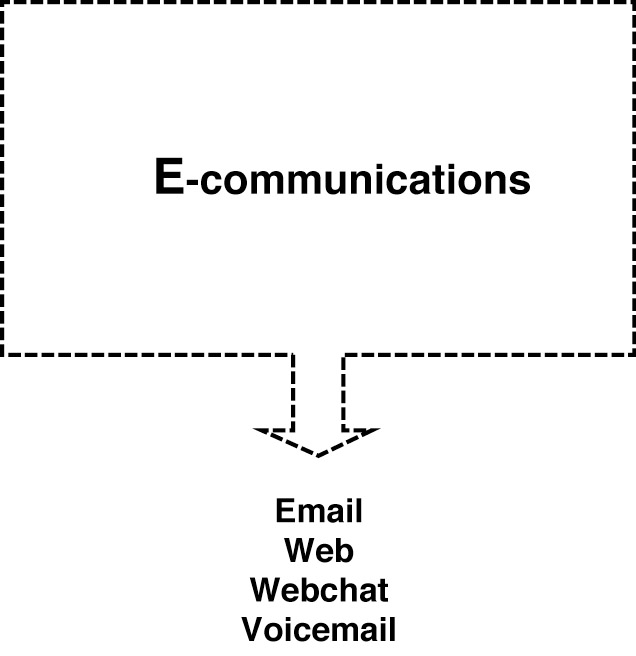 While the dot.com bubble may have burst, one of its legacies is thriving—e-communications (see Figure 5-1). From corporate intranets to e-newsletters as well as the all-pervasive email, we are all more connected, or e-connected, than ever before. Rosabeth Moss Kanter has written, "Communication is the core of e-culture." Much of this connectedness is good. We can work from home, from the airport, from a remote office, or from a beach in the Bahamas—often more productively—thanks to the proliferation of e-communications. Being connected 24/7 is our mantra—always on, always available. Hold on, though! Maybe all of this connectedness has a price, and a big one. A loss of privacy. A loss of free time. A loss of touch with the people who are nearest and dearest to us. A loss of everything except work time. Leaders need to be aware of the power of e-communications. Leaders do a great deal of communicating electronically. In fact, most people will have more contact with the leader through email than face to face. The ability to express a leadership point of view in words only is essential. When used successfully, e-communications will help lay the foundation for a virtual community. The hub of the e-community is the web site. The lifeblood of the e-community is email. Email also has its perils. Most of us are inundated with too much email. Leaders need to limit their use of it when sending leadership messages; otherwise it will not be read. Also, email cannot be a substitute for face-to-face encounters. There are times, such as in coaching, when only face-to-face contact will do. You can follow up a coaching session or a team meeting with an email, but only after the personal connection has been made. Rosabeth Moss Kanter, E-Volve!! Succeeding in the Digital Culture of Tomorrow, p. 7.